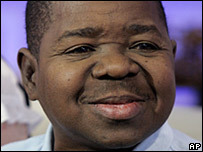 Former Diff'rent Strokes star Gary Coleman has been accused of hitting a man with his truck after arguing with him at a bowling alley in Utah. Payson police Lieutenant Bill Wright said the actor had been rowing with Colt Rushton before the incident. Mr Wright said it was not clear whether Mr Coleman hit Mr Rushton on purpose as he backed out of a parking space. Mr Rushton was taken to hospital and treated for minor injuries. Neither man has been charged with any offences. Speaking to local newspaper the Deseret News of Salt Lake City, Mr Wright said: "We've been able to establish there was an argument between the two, due to pictures Rushton wanted to take. "He took some of Gary Coleman, and [Coleman] wasn't happy about it." Neither Mr Coleman nor Mr Rushton could be reached for comment, and police say the men have not offered them much information about the incident. Mr Coleman played Arnold Jackson in the US TV show Diff'rent Strokes from 1978 to 1986. He pleaded no contest in California in 1999 to disturbing the peace after he punched an autograph-seeker he claimed insulted him.